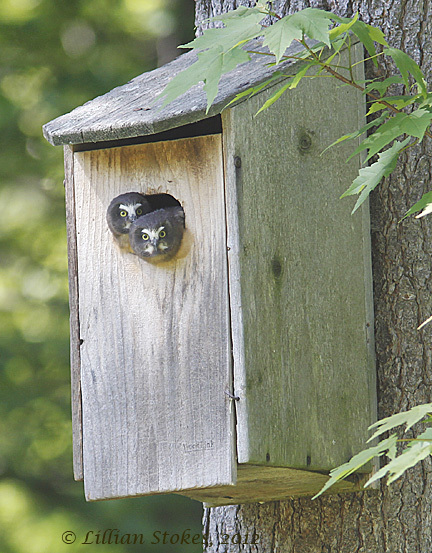 Right on cue recently, the day we were doing the NH Audubon Birdathon fundraiser, baby Northern Saw-whet Owls poked their heads out of the duck nesting box in our yard, and we hadn't even known they were there! Of all the days for this to happen, this was the best. For the birdathon, teams compete in several categories, such as statewide, human-powered, chapter area, big sit, etc. and see how many species they can count in a 24 hour period, with donation pledges for number of species seen. We choose the "big sit"category and stayed in a 17 ft. diameter circle on our deck and counted species from there (our total was 69 species). In the morning, Don scanned over to the nest box by our barn, looking for the Hooded Mergansers who often nest there and said "wait a minute, that's not a duck, that's an owl!" 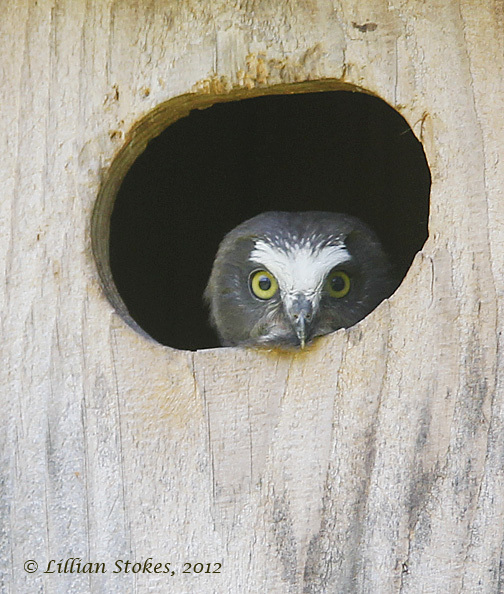 A little head was poking out of the box looking our way, and we suddenly realized, not only was it an owl, it was a baby Northern Saw-whet Owl. Wow, much excitement! We were away during the winter and obviously adult owls had moved in and begun breeding. 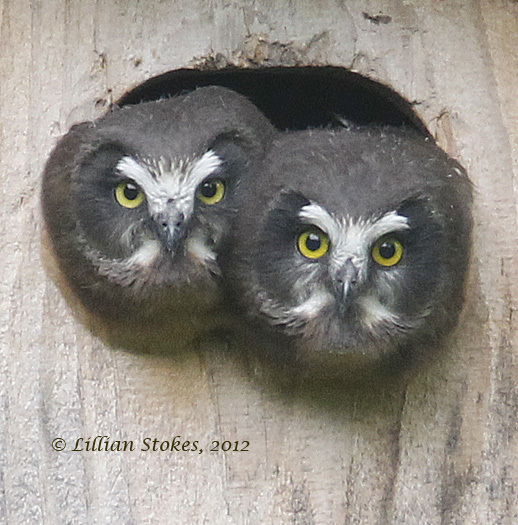 This was the day the young owls had gotten big enough to climb up to the entry hole and peer at the world. First one owl made an appearance, then by later in the afternoon, a second owl jostled its way up to the hole and we discovered there were two! Not only was this exciting for us, but two other birdathon teams stopped by our property and got to count the owls on their lists also. 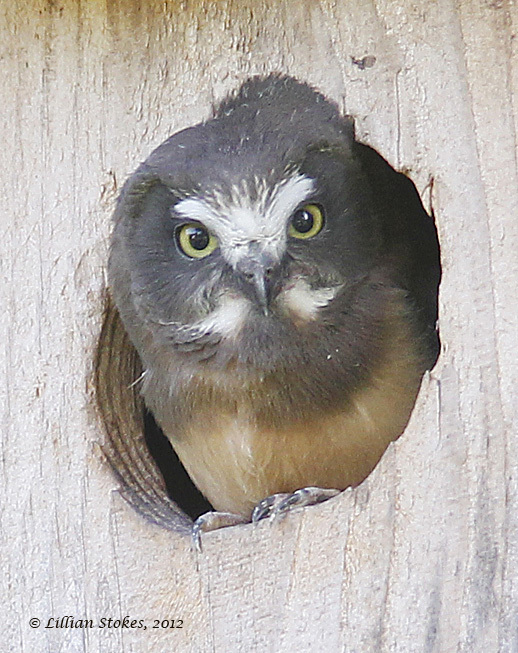 Birding is fun, competitive birding is really fun, but finding baby Northern Saw-whet Owls on a birdathon and on our own property, was really, really, really fun! So Cute! We had baby owls that would come to our bird bath and drink after dusk. They don't see well, so they could hear us, but they were moving their little heads around trying to spot us. We were at the back door and they were just a few feet away, across the driveway. I miss that house because I had a wonderful window with birdfeeders nearby where I could watch while I journaled, and while we ate our meals. Thanks for getting these pictures. I enjoy both your blogspots. What a terrific find and in your own backyard! The little owlets are adorable. They are so cute!! !Great post. Expecting the unexpected is a big part of why birding is so much fun and this post exemplifies that. How exciting Lillian!!! Very very cool. ...what beautiful faces!! I loved this post and those gorgeous eyes! Fantastic! A most wonderful surprise! They are precious little owls. Love their big round eyes. Lilian, I so agree and how I wish I had seen them too! I do not have this species on my life list and despair of ever finding one! What cuties!